Tell us a little about yourself: what is your first name, how old are you, and what is your favorite flavor of ice cream? My name is Jace. I am 10 years old and my favorite flavor of ice cream is mint chocolate chip. What book did you read and why did you choose it? I read the first book in the Kane Chronicles, The Red Pyramid. I chose to read this book because I'm in to mythology like Egyptian and Greek. Can you describe this book in one word? Magical. What was your favorite part of this story? My favorite part was when the Kane children found out that they were hosting gods because they had so much power. If you had a problem similar to the main character's problem, what would you do? If I had a similar problem that the main characters had, I would train as hard as possible to find the full extent of my magical powers. What would you say to your best friend to convince them to read this book? "Dude, you've got to read this book if you like Egyptian mythology." What do you think about the book's cover? 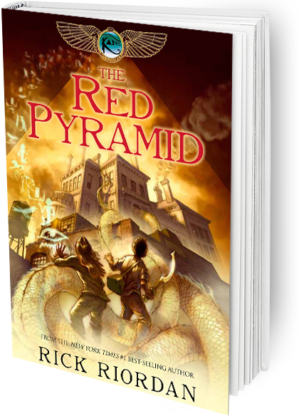 I think that the cover helps me picture when they found the Red Pyramid. Would you want to read another book about these characters? Yes. Can you name another book that reminds you of this one? The Lost Hero in The Heroes of Olympus series. If you could ask the author one question about this book, what would it be? Why did you choose to write mythology? We found the answer to your question on Rick Riordan's website. He says that his son asked him to tell him some bedtime stories about gods and heroes. Mr. Riordan had taught Greek myths for many years as a classroom teacher. When he ran out of myths, he decided to make up some new ones with the same characters. Thank you, Jace, for sharing this book with us! Since their mother's death, Carter and Sadie have become near strangers. While Sadie has lived with her grandparents in London, her brother has traveled the world with their father, the brilliant Egyptologist, Dr. Julius Kane. One night, Dr. Kane brings the siblings together for a "research experiment" at the British Museum, where he hopes to set things right for his family. Instead, he unleashes the Egyptian god Set, who banishes him to oblivion and forces the children to flee for their lives. To stop him, the siblings embark on a dangerous journey across the globe--a quest that brings them ever closer to the truth about their family, and their links to a secret order that has existed since the time of pharaohs.